What is the perfect trip? One where you experience everything possible? Our recent trip to Florida probably wasn’t perfect, but we had fun every day, discovered some new things, and made a new friend. That’s pretty much what happens to Molly and Michael in every one of our books. In that sense, it was a true Molly and the Magic Suitcase adventure. I can’t share the whole experience at once, so we’ll keep it topical. This post features or two best eating experiences. Our goal was simple: get to the beach! We’ve been to two destinations that are within a long day’s drive of the Indianapolis area and decided to return to Destin, Florida. 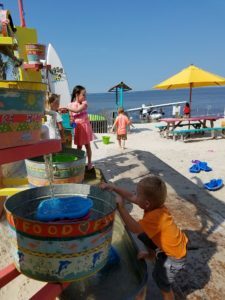 Destin is an area growing in popularity and the town has grown tremendously in the past ten years or so. Our initial visit was on a recommendation from a soccer teammate. Molly, Michael and cousins enjoy the kids area at Lulu’s. The drive was an easy one and the kids were great. We have a 2008 Town & Country touring model. It allows you to remove or swivel the middle seats and install a table. For this trip, we did both. One seat was out (90 lbs…whoof!) and the table was in. The real Molly and Michael loved the new setup and we’ve kept it since. Amy and I always manage at least one wonderful food experience when we travel. This time out, we found two places we’d return to in a heartbeat. Lulu’s is a place owned by Lucy Buffett, sister of Jimmy. The beach lifestyle is the focus with a wonderful area to distract the kids while the food is prepared. 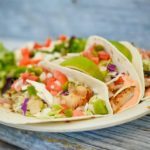 Lulu’s prides itself on using fresh ingredients and with some fish offerings you can see when and where your fish was caught, as well as who caught it. The food itself is excellent. I usually reserve my seafood eating for when I can “see the sea.” Browsing the menu, it may look like a typical shoreside restaurant, but because of the insistence on freshness, you’re going to have a much higher quality meal here. We started with the “Holy Guacamole!” and I selected a simple, grilled grouper sandwich. The grouper came with a wonderful mild tartar spread, clearly a house recipe. The portions were generous and everything delicious. It was a family affair as we met Amy’s cousin Tim and his two kids. The smaller cousins had a great time playing together and, thanks to the kids area, the adults had a chance to visit as well. Parents, you know that alone is a value worth paying for and it’s another reason for us to return to Lulu’s next time we’re in the area. First look at Hurricane Oyster Bar & Grill and what I noticed was the “Locals Eat Here” sign. I knew at that point we were in good hands. 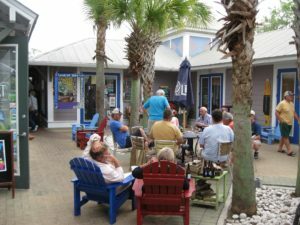 The second place you need to know about is the Hurricane Oyster Bar & Grill in Grayton Beach, part of a larger area, including Santa Rosa Beach, known as “30A.” Whatever your first impression is of the place, your last thought will be, “that’s some of the best food I’ve ever had.” It was a superb dining experience. Our server brought out tortilla chips along with salsa and this was our first indication of things to come. The chips were excellent. You don’t expect to praise this pre-meal offering, but I have to. They were excellent with a seasoning we couldn’t get enough of. We gobbled them up and ordered our entrees. 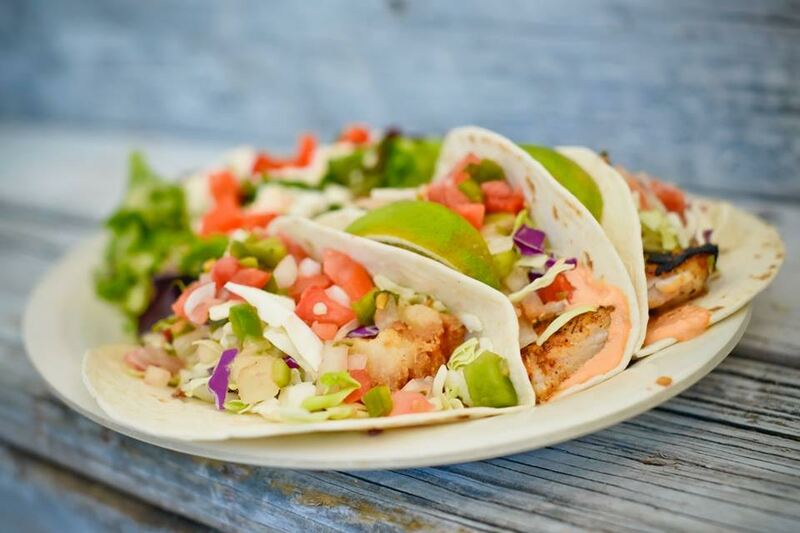 Fish tacos at Hurricane Oyster Bar & Grill, their photo. The Crab Cakes were simply perfect. I don’t know how they can be so tender and not fall apart. That’s to say nothing of the flavor. I could use any superlative to describe it, but the bottom line is you must try go there and try them. Amy had the Fish Tacos (blackened) with black beans. She was thrilled with the tacos, but the black beans are what she still talks about. The tacos brought some heat, and the flavors made you forget all about it. I’ll stick to just talking about food and wrap it up here. Future posts will talk about the 30A, our activities and diversions, and our accommodations. It was a wonderful trip and I look forward to sharing the other details. Don’t miss out on these two places, whether traveling with children or not. The Hurricane Oyster Bar & Grill is just behind Wolfgang Puck’s El Postrio in my ranking of dining experiences. Get on a plane or in your car and go now!